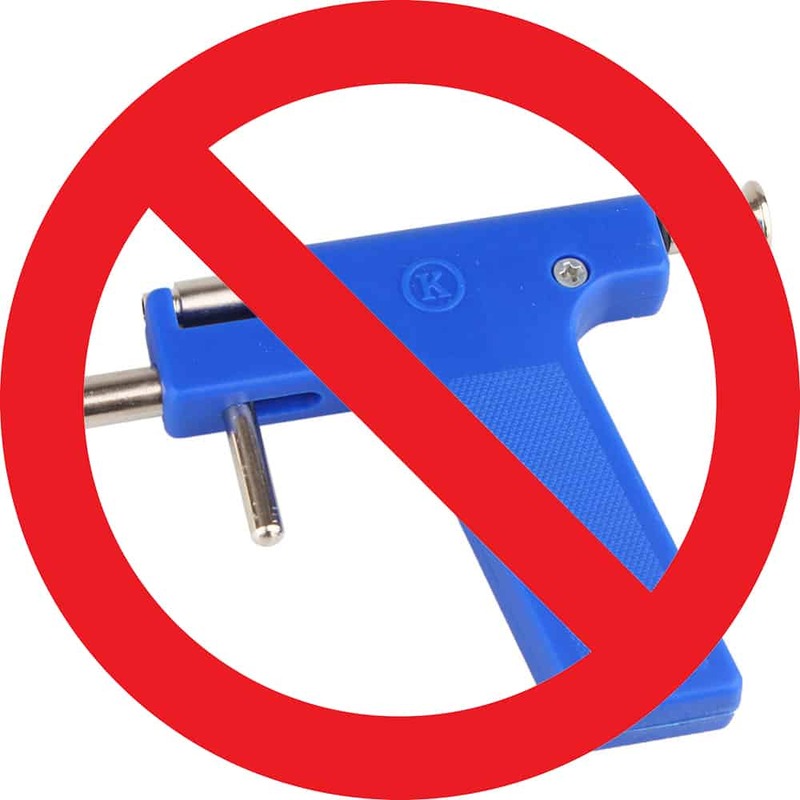 One question asked by clients regularly is if we use a gun for piercings. While piercing guns may seem to be a quick, easy and convenient way of creating holes, there are major drawbacks when it comes to tissue damage, sterility, and inappropriate jewelry design. Though slightly pointy in appearance, most ear piercing studs are quite dull. Piercings must therefore be accomplished by using excessive pressure in order to force the metal shaft through the skin. The effect on the body is more like a crush injury than a piercing and causes similar tissue damage. At the least, it can result in significant pain and swelling; at the most, in scarring and potentially increased incidence of severe tissue disfigurement. From time to time the intense pressure and speed of the gun’s spring-loaded mechanism is insufficient enough to force the blunt jewelry through the lobe. In these cases, the earring stud may become lodged part way through the client’s ear. The gun operator, who may not be trained to deal with this possibility, has two options. They can remove the jewelry and re-pierce the ear, or the operator can attempt to manually force the stud through the piercee’s flesh, causing excessive trauma to the client. When used on structural tissue such as cartilage, more serious complications such as auricular chondritis, shattered cartilage and excessive scarring are common. Gun piercings can result in the separation of subcutaneous fascia from cartilage tissue, creating spaces in which fluids collect. This can lead to both temporary swelling and permanent lumps of tissue at or near the piercing site. A piercing performed with a single-use, sharp, surgical needle minimizes incidences of damage and tissue separation. Also, the needle slides smoothly through the flesh, safely pushing the tissue aside to make room for the jewelry to be inserted. That may not sound too appealing, but it is actually a very quick process and the method is much less painful.